I’m proud to be one of the senior champions for gender and have been for nearly 7 years, from when I started in the Environment Agency. Back in 2009, the percentage of women in senior management had not changed for years and I wanted to know why. At the same time, a group of staff came up with the idea of starting a Women’s Network. So we set off together, with me raising issues of gender diversity at the top of the office and the then new network forming a grassroots group of volunteers. Initially both the network and I had to work hard to get attention for gender diversity and it’s fair to say we were a bit provocative at the start, with the network acting as a “ginger group” to spur some action, and me being rather persistent in the boardroom. Our respective roles have evolved over time: once the issues were acknowledged, we moved into supporting the organisation to tackle them and influencing different groups. The approach needs to suit the circumstances. There are lots of great initiatives I’ve been involved with in the last 7 years that I’d like to share with you today, on International Women’s Day. Promoting inclusion doesn’t need to be all about big initiatives. There are some simple things that any senior leader can do to help support female colleagues, especially hand in hand with a network. Improving gender diversity won’t work without the support of men. So recently we’ve focused on getting them more engaged. We ran a number of male focus groups and familiar-sounding issues came up, such as raising the profile of shared parental leave and tackling the perceived stigma around men working flexibly. More recently, I have been involved in sharing learning with other gender champions and networks. 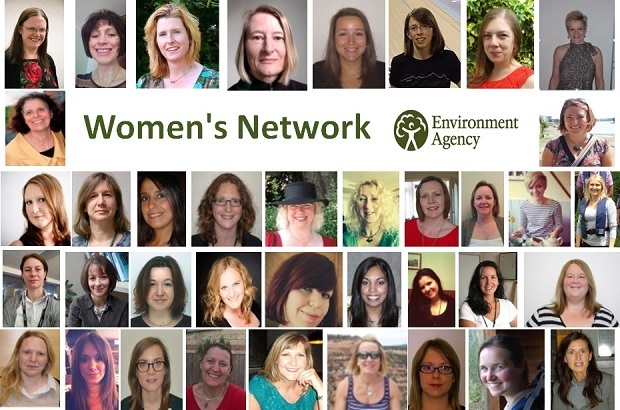 The Environment Agency and Cabinet Office co-founded the Cross Government Women’s Network, to share best practice. The Network has had a great first year and I’m looking forward to swapping notes with others on the role of a senior champion. The results of this pincer movement: the percentage of women in senior grades has risen year on year, especially in the feeder grades just below senior management. This is crucial, as we have to support more women to make that leap to the top: we have to help them overcome the barriers whether these are self-limiting beliefs or institutional obstacles. I’m pleased to say we have gone from 23% women in senior management in 2007 to 34% today, but we have a still have a long way to go to get to 50% so we can’t afford to let up!